admired by your entire neighborhood. 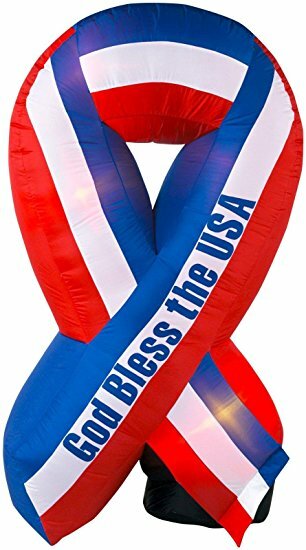 This Large 6 ft.t Red, White, and Blue Patriotic Ribbon.Patriotic Inflatable with the words God Bless America. Great way to show your Patriotic Spirit this summer. Great for Memorial Day, Flag Day, 4th of July, Labor Day, and President’s Day. This Air Character Air Blown Inflatable Patriotic Decoration comes with built in Heavy Duty fan, internal lights to create a glowing night-time display, yard stakes, stand and tethers. deals that you will surly enjoy. entries on the rafflecopter entry form below. and will not be responsible for the awarding or shipping of the prizes to the winners. Next post: Aluminum Trendy Metal Signs Giveaway!